The Fantom Drives 250GB DataShield USB 3.0 AES Hardware Encrypted Portable Solid State Drive features 256-bit AES military grade hardware encryption. There is no software required for setup and it is compatible with PC and Mac platforms. The Fantom Drives Data Shield encrypts all of your data and keeps it safe from unauthorized access even if the solid state drive is removed from its housing. With a SuperSpeed USB 3.0 interface, you can now access your files faster than ever before. This USB 3.0 unit is backwards compatible with USB 2.0 so you can connect to any USB port. 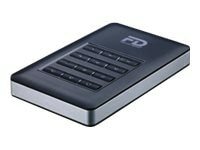 Fantom Drives Data Shield is a pocket-sized portable solid state drive with a built-in keypad and up to 12-digit pass code combinations will protect your data from unauthorized use. This unit is fully bus-powered design keeps you free from a power cord and power supply. It is ideal for personal or business use where data privacy is required.